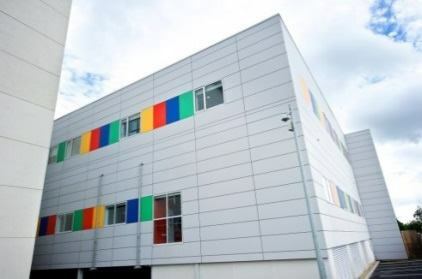 The Cardiology Inpatient Unit Project in Our Lady’s Children’s Hospital Crumlin involved the design & build of a 1035m2 new build rooftop extension onto an existing steel frame building within the live hospital environment. The existing building below was a live Pediatric Intensive Care Unit and was maintained in full use without interruption for the full duration of the project of approx. 12 months. There were also 2no. existing wards refurbished and several new links created from the new build extension into the existing surrounding hospital buildings as part of the project. Construction of the new extension involved careful planning in all aspects and stages of the project requiring continual liaison with the client and user hospital representative to ensure all works were coordinated in the best possible way. 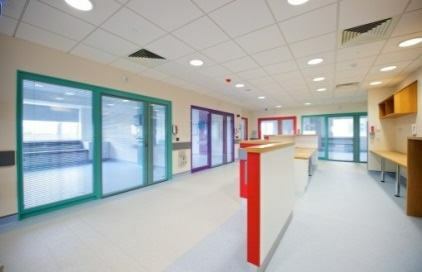 Key elements requiring detailed planning included to construction of the new steel structure directly above the live PICU ward, creation of the new links into the existing building, refurbishment of the existing hospital wards within the live hospital environment and all service tie-ins and alterations that were required throughout the project. Careful consideration was given to the planning, management and control of noise, vibration and dust given the extremely sensitive nature of the surrounding environment throughout the project involving detailed planning and use of precise method statements. All method statements were issued well in advance of planned works to ensure client approval and time for any control or contingency measures to be put in place prior to the elements of work proceeding. The new “state of the art “Cardiology extension unit is a 25 bed unit which is finished to the highest standards and without impacting on the surrounding hospital service. The unit includes single and multiple bedrooms, isolation rooms, treatment rooms and all associated staff and ancillary areas. This complex project was completed ahead of programme and to the client satisfaction.